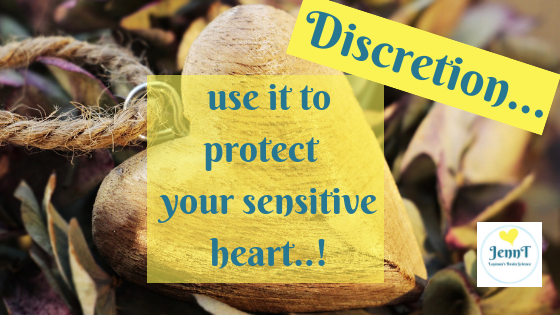 Jenn Turnham > Blog > Jenn Turnham's Words > Discretion – use it to protect your sensitive heart…. Discretion as protection is a new concept I came across recently – and one that can be quite difficult for Highly Sensitive Extroverts! As Extroverts we tend to share A LOT of ourselves with the world…. but have you ever found yourself thinking “Oh dear I wish I hadn’t shared THAT much…..!!”? This can result in feeling embarrassed, exposed & vulnerable. BUT can often times lead to being hurt if we open up to the wrong people….